Upon entering, one first encounters the Sea Lion Pool, and beyond that a triangle of exhibits which host lions, monkeys and elephants. To the east past the lake and Bison Range are five oval aviaries joined by ramps. The aviary enclosures simulate different climates and areas of the world, ranging from swamps, savanna and tropical rain forests; right down to the rain storms. To the west lies the Aquatic Bird House, which is home to the zoo's penguins, as well as the DeJur Aviary and the Rare Animal Range. Also found in this area is the Children's Zoo which consists of farm animals, a beehive, as well as pony and camel rides. No adult is granted admittance to the Children's Zoo unless accompanied by a child. 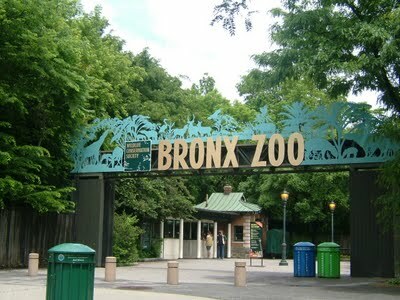 These are not all the exhibits, as the Bronx Zoo also boasts a large Reptile House, the Great Ape House and a special building called World of Darkness, which is nearly lightless and features nocturnal creatures under a dim red lighting. All of the enclosures are arranged according to continent, and most have a speaker-box which can be activated by a little plastic elephant-shaped key; available for purchase at the zoo's entrance.